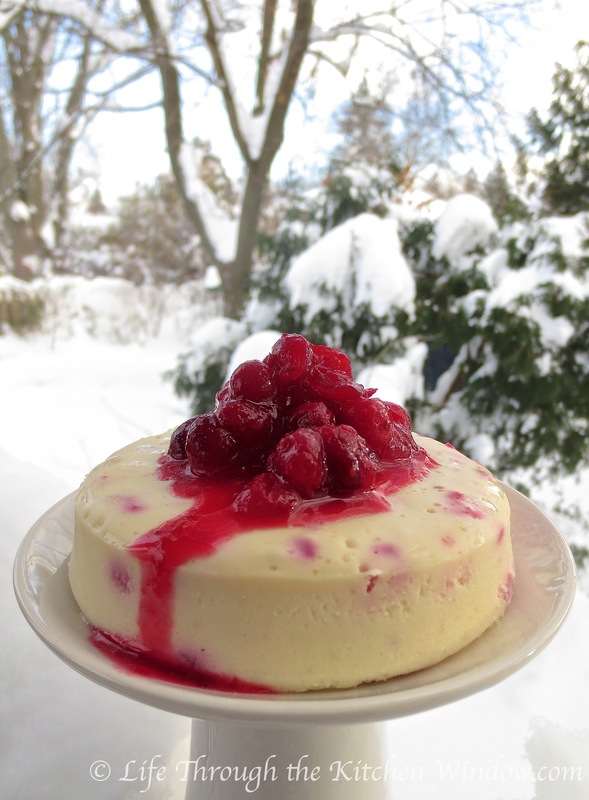 There’s something about a cheesecake that signals ‘special occasion.’ And when that creamy, rich confection is flecked with bright red chopped cranberries and topped with a tart cranberry sauce, it is indeed a festive dessert perfect for a wintry day or any holiday gathering. I don’t make cheesecake often, but when I do, I prefer it to have some zing. Not only does a tart flavouring offset the richness of the cream cheese, but it’s a well-known fact that anything sour dissolves calories (right?). For my contribution to dinner at my cousin’s home this weekend, I thought about the lemon cheesecake that was my signature dessert back in the day. I’m glad that my mind did one of those associative leaps, in this case from lemons to cranberries. After all, not only are they tart, but their vibrant redness is perfect for this holiday season. Incorporating chopped cranberries into the batter adds colour, flavour and — just as important– textural contrast. 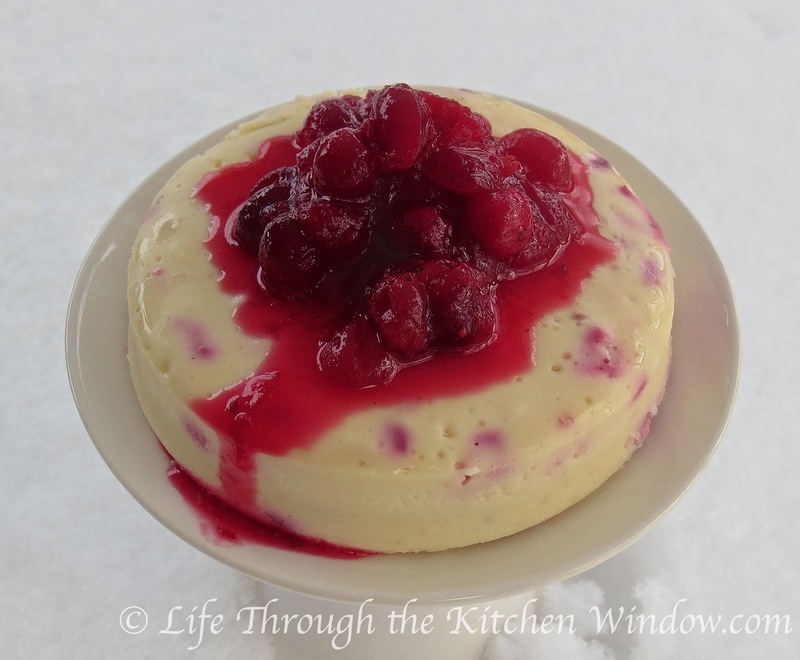 The cranberry topping includes lemon, orange and a scant amount of sugar, resulting in a tangy, bright complexity of flavour that’s the perfect counterpoint to the decadence of the cheesecake. As if the cake itself weren’t beautiful enough, Mother Nature delivered a good two feet of snow to our backyard, creating the perfect winter wonderland backdrop for the photos. The next time I make this cake, though, I could do without the snowstorm, thank you! This recipe is enough for an 8-inch cake made in a springform pan. For the sake of the all-important photo shoot, I made a 7-inch cake to take to the dinner party and a 4-inch cake to photograph the next day. Baking time depends on the size of the pan; the taller the cake, the more time to bake. Pre-heat the oven to 325ºF. Butter an 8-inch springform pan, line the bottom with parchment paper and butter the paper. Wrap the pan in a piece of tinfoil large enough to reach up to the top of the tin. For extra insurance, you can add a second protective layer of tinfoil. Get out another oven-proof dish, large enough to hold the springform pan with some room around it. This will be used to create a water bath (or, bain marie). Put a kettle on to boil so that it’s ready about the same time the cake batter is done. Unless you’re in training for a rowing team, I recommend using a stand or hand mixer to beat the cream cheese until creamy. Add the sugar and beat until light, scraping down the bowl part way through. Add the eggs, one at a time, and beat until each is incorporated. Pour in the vanilla along with the last egg. Scrape down the bowl and continue to blend until the batter is smooth. Stir in the chopped cranberries, distributing their ruby beauty throughout the batter. Pour the batter into the prepared springform pan and set it inside the larger baking dish. Place the pans on the partly pulled-out middle rack of the oven. Carefully pour the hot water into the outer baking dish, taking care not to splash into the lovely batter. Gently slide the rack back into the oven (don’t make waves! ), and bake the cake for about 60 minutes. When done, the cake will be only slightly wobbly in the centre; it will continue to firm up as it cools. Remove the springform pan from the water bath and peel off the foil wrapping. Set the pan on a rack to cool. Once it’s not hot to the touch I finish cooling mine, uncovered, in the refrigerator. Cover when cold. When it’s time to serve the cake, run a knife around the outside before releasing the ring of the springform pan. Then run a knife or large cake lifter between the parchment paper and the cake and transfer it carefully onto the serving platter. Or, you could invert the cake onto the plate and then peel off the parchment. I make this topping a little looser than a typical cranberry sauce, so it will flow nicely over the cake. Place all the ingredients into a small saucepan over medium heat. Once the cranberries start to pop (about 5 minutes), turn the heat to low and simmer for about 10 minutes, stirring once or twice. Remove from the heat and cool. Chill in the refrigerator until it’s time to lavish this topping on the cake. This looks delicious! Cheesecake is my favourite and I have never made one without a crust… which means I should try this recipe out! Love the snowy pictures too! This sounds delicious and is beautiful with the background of snow. Hopefully if I make it, we won’t get a snow storm. 🙂 BTW, how long would you suggest baking a 4″ cheese cake? I certainly hope this cake won’t be a harbinger of snow on a regular basis! I baked the 4-inch cake for about 40 minutes. You might want to check it after 35 minutes, since much depends on our ovens! The Chocolate Espresso Cheesecake on my blog made 2 4-inch cakes (divide a regular cheesecake recipe into 3 for that). 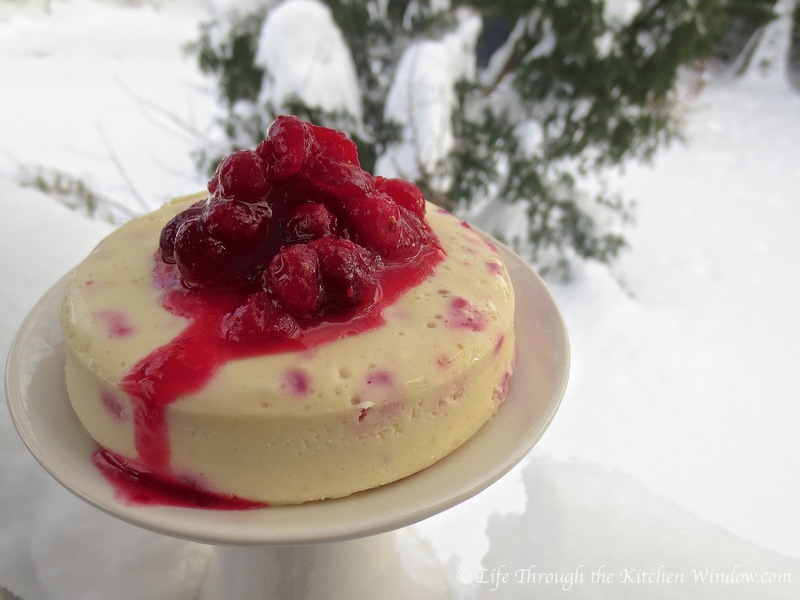 This looks great, I too would appreciate the tartness of cranberries to offset the sweetness and richness. The cheesecake and scenery look wonderful. Very envious of your fresh snowfall, we rarely see snow here. Thanks. Thanks for the compliment! The snow looks pretty falling, and it makes a lovely backdrop for the photos, but driving in the snow squalls we had was not a pleasant experience. We had a white-knuckle ride Saturday night. It’s a bit warmer now, so the snow is melting and compacting, and sidewalks are getting treacherous. It’s a bit of a mixed blessing! I don’t recall ever seeing my mother use actual cranberries in the kitchen when I was a kid; just the gloppy gel in the can. I’m wondering if maybe they weren’t widely available fresh back then. She certainly used them in later years. I’m trying to get away from the ‘cranberries are for sauce’ rut, and use them in a variety of ways. Wait until you see my next dish featuring them! What a perfect cheesecake specimen! And fabulous photos as well! Beautiful! Thank you, Mimi, I appreciate the compliments! I’m trying to make the best of our weather for my photo shoots. I just have to remember to get out there during the day because it gets dark so early right now.